A record price of 6,200 guineas was achieved during a day of strong trading at the NSA Wales and Border Ram Sale at Builth Wells. There was a definite buzz on the Royal Welsh Showground from early on as buyers arrived early to select from more than 8,000 rams of 40 different breeds in 20 different marquees. Turnover was slightly up on last year at £1.85 million, with a very high 82% clearance. Averages across the breeds were also up at £309.33. A dozen rams made four figure sums. Chairman George Hughes said he had been pleased to note that many buyers were out early looking at pens in order to select a purchase. It had been a good sign. “It was a strong trade with an exceptional choice of quality rams with many high prices”, he added. “After a difficult summer the way sheep have sold here has demonstrated the confidence buyers have in the sheep we offer for sale here. "The sale has become a real attraction for sheep people and it's amazing how far they have come from. They are here from Scotland and a fair number from Ireland and they've come both to buy and to sell". Another Charollais ram lamb went for 2,800 guineas. It was owned by Adrian Mansel Davies of Manordeilo. He’s an animal health officer with the state veterinary service in Carmarthen. It went to F H and M Kennedy of Western Parkgate Farm, Parkgate, Dumfries. Other high prices included 2,500 guineas paid for a Beltex ram lamb owned by Michael and Heulwen Owens of Glantre Farm, Llandysul. The couple sell regularly at the NSA Wales and Border Ram sale and were ecstatic as they ‘knew he had star quality’. It went to Richard Pilkington of Shordley Hall, Hope, Wrexham. A Blue Faced Leicester shearling, second in its class sold for 1,700 guineas to Mr Harris, Hope Farm, Llandeilo. 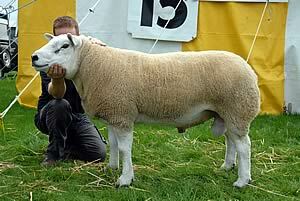 It was bought as a ram lamb at Carlisle by Dewi Jones of Plas Pigot, Llansannan, Denbigh. Tim Pritchard who had last year’s highest price of 5,000 guineas had a top price of 1,550 guineas for one of fourteen Charollais ram lambs he brought. And the Kerry Hill champion sold for 1150 guineas to a consortium of four buyers, led by J & P Owens of Woodhouse, Shobdon, one of them being sale sponsor Alan Symonds of Symtag. Alan Symonds went on to buy a 2 year old ewe to accompany it from Pam Chilman. “I’ve been bitten by the bug after twenty very enjoyable years here”, he said before going off to buy a 2 year old ewe to accompany it from Pam Chilman.of Presteigne. A Lleyn ram sold by D N Bennett and Son, Tyn y Coed, Pontrobert, Meifod, Powys, made 2,550 guineas and was sold to D W Lillyman, Pound Farm, Buckland Monocoram, Devon. Another Lleyn sold by Mr and Mrs T Rees and Son, Foel Fach, Manordeilo, Carmarthenshire, made 700 guineas. A North Country Cheviot sold by R and T Dun of Heriot Midlothian, Scotland, made 900 guineas and went to R L Roberts of Bryn Mellon, Gwynedd. The Balwens had a good day with an older ram sold by K & S Lewis of Tynewydd Farm, Seven Sisters, Neath, making 1120 guineas. It went to K Earle, Llwyncrwn, Penybont, Carmarthen. A ewe sold by the Lewis family made 780 guineas and also went to K Earle. It was an indication of the buoyant trade enjoyed by most breeds at the sale. Quality sold well. And enjoying the quality was American Robert Swift and his wife Mary. The couple keep Suffolks and Southdowns and encourage children at Robert's local 4H club to show. They came to Wales especially to look at the huge range of breeds on show.